Used widely as hedging plant or low growing windbreak Duranta repens is popular with landscapers for its easy to prune nature. The best known varieties include the popular ‘Geisha Girl’, wonderful blue flowers in spring and good green foliage year round. Although the species can reach a height of 5m over time Duranta repens can virtually be pruned at any time of the year. Used for its fast growing nature D. repens is also suited to coastal conditions. Also known as the ‘Golden Dew Drop’ for the yellow berries that follow the flowers, as well as ‘Pidgeon Berry’, in some areas the species can be a little invasive, however the cultivars are reportedly of a better habit. Best areas are tropical to sub tropical regions however will grow well as far south as Sydney and the mid south coast of NSW. The blue flowers are small but attractive, the foliage lasts well year round. Duranta repens ‘Sheenas Gold’ has good golden foliage, grows well in full sun to part shade, but not suited to deep shade. Around 3 – 4m in height. Duranta repens ‘Geisha Girl’ has pale green foliage and deeper blue flowers, reaches around 2m in height. 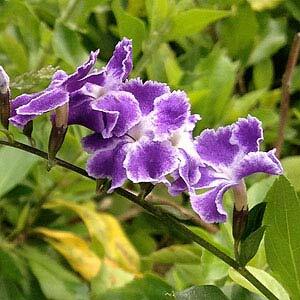 Wholesale Duranta plants are available from the following nurseries.